at the Basilica of St. Anthony in Padua! Celebrate Easter with the friars of the Basilica of Saint Anthony! This year Easter is further enlightened by our beloved Pope Francis’ letter to the Youth of the World that he delivered at the end of the Synod of Bishops. The 5:00pm Holy Mass with the Imposition of the Ashes will be celebrated on Wednesday 14 February. This Mass will be streamed live. The great participation of devotees in the procession that has been marking, for the past 750 years, the discovery of St Anthony’s Incorrupt tongue is taking place again. February 11 marks the XXVII World Day of the Sick. At 8:15am the friars of the Basilica of Saint Anthony in Padua will celebrate a special Mass dedicated to all those who are sick. 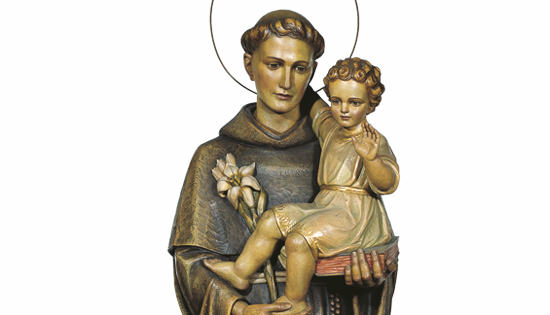 Two holy relics of Saint Anthony of Padua will visit the Diocese of Savannah, Georgia, from Friday, February 22 to Sunday, March 3. Merry Christmas to all the friends of the great family of St. Anthony from the friars of the Basilica of Saint Anthony in Padua, Italy! The cam films the area around the Tomb of St. Anthony every day for the whole day.